Lightly blanch large cabbage leaves and set aside. In small frying pan combine ground beef, onion, garlic and spices and cook until brown. Spoon ground beef mixture into cabbage leaves, tuck in ends and roll up (burrito style). Put cabbage rolls in a baking dish and add broth to the bottom of the pan. Brush lightly with beef broth and bake in oven for 20-30 minutes. 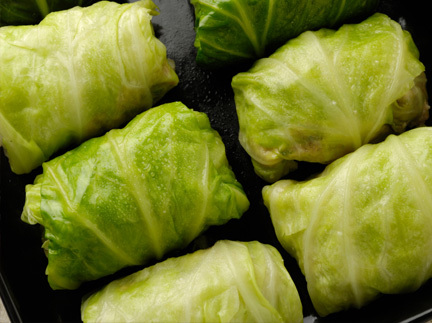 Spoon sauce over cabbage rolls periodically to keep moist. Make multiple servings at one time for best results.